Can't believe what I'm reading about people being cold at 40 degrees - are you zipping it up, putting on the hood, and using the neck baffle? I have yet to even use the neck baffle, and have slept with it nearing freezing temperatures - most of the time I sleep half out of it, naked, unzipped from the bottom part way up. For the price I think that this bag is unbeatable. It does maybe leak down a little faster than other bags I've experienced, but who really cares - it may make a significant difference after years of heavy use, but then go head and take it somewhere that works with down and restuff it, or add a bit of down. I really don't have any complaints about this bag except that I sleep too hot in it. I may get another lighters, higher temperature rated bag for summer. Very roomy head, lots of room in the feet, compresses small, lightweight, and about 200 bucks less than the exact same thing around. This is a great bag, for the lb and the price you really can't get any better. At least it was the best choice at the time when I got mine. That was about 2 years ago, I have been on about 24 to 28 trips since then. Only 5 of the trips did the temps drop past 32F. When it did I was very warm, my water bottle was frozen the next day inside the tent. 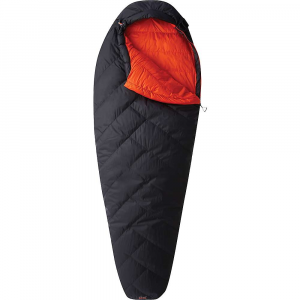 Get a thick sleeping pad an "R" rating of at least 3.0, with the REI Plus you will be fine. Great bag, great size and super light! OK, this review is from somebody who knows what they are talking about. Don't be scared by the reviews that claim this bag is not suitable for its temp rating. I have used this bag in single digit temps, wearing only a layer of midweight thermals and a hat... I was extremely warm and cozy. So warm I had to take my hat off... and I am not a warm sleeper. I would be comfortable using this bag in below freezing temps if I had on enough layers. This bag is very light and packs small. The longest trip I have used this bag on was only four days, but the shell did a great job of managing tent condensation and I was not able to air it out due to rain. The shell is light, but I notice some feather leakage from time to time. Which is why I don't think this bag is a 5/5, but I have never owned a down bag that does not leak feathers. All in all, for the price... this bag performs above what you pay. It is structured so that more down is on top where you need it and it is compartmentalized so down does not shift. I would recommend this bag, but I have seen some other manufacturers that have bags with a Pertex shell which they claim is leakproof (feathers). 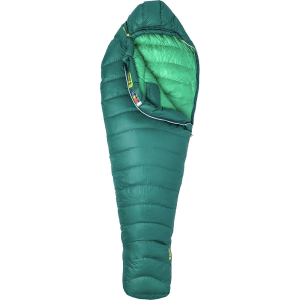 I don't know much about Pertex while writing this, so look into it and see if it is breathable and light. I would guess it is, so it may be a better option only if it really is leakproof. I take this whenever I go backpacking. If it's too warm, I use it like a blanket. I was in Mojave Desert during Nov 2005 and was comfortable at 29F. And that was with two 2-liter bottles of water and a full camelbak with me. It is down, so it is lightweight and compacts to a super small size. All my friends love to borrow it on their trips. No complaints no matter where they go. At $280, it's a damn large investment for me (college kid), but it's rewarded me with very plesant nights in extreme temepratures. Haven't put it to a real test yet, but after hearing complaints about the temperature rating, I figured I should share my experience so far. I'm amazed that someone would shiver at 40F in this bag. I have slept in it down to about 32F and only had it zipped half way up to avoid being too hot. So I can't say this bag is definitely good to 0F, but it can't be that far off if I sweat in it at 32F. Picked up at a Crash & Dent sale, was looking for a snow camping bag. It had a two small tear & had lost 1-2" loft in 3 chambers & draft collar. Used in a snow trench with 1/2" foam pad, Silk liner and 2" Thermarest in 10 degree weather. Had some cold spots, means I need to restuff those areas and it should be up to the 0 degree as stated. Tip: Pre-heat the bag, exercise or eat more to keep warm in any bag. Scratch and dent sale baby! Got a great deal on this bag because it "leaked feathers" which nearly every down bag does, albeit very slowly. 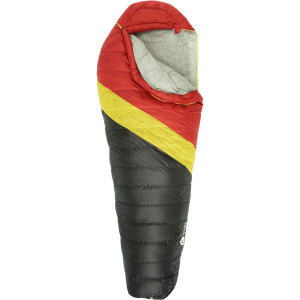 I have only tested it but my girlfriend (very warm sleeper) used it in the summer on 50 degree nights (all the way zipped up of course) and loved it. Just 5 minutes in it at room temp is enough to get me sweating profusely, great sign. Going heavy on the insulation up top and compartmentalizing the bag are both great features. Mummy design and cinch cord have worked great for me. I don't feel cramped at all. I used this bag at -5 with a 30 degree bag as the outer and wasn't toasty, but warm enough. Of course I can't blame it on the kilo because there could have been some compression of insulation with the double bag technique, and there was definitely some frost in the tent as well. Gets the job done though! 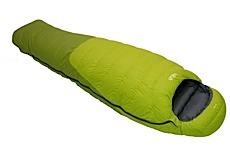 Lightweight and packs small, the compression sack is a nice features, even though I know some people aren't crazy about it I like it enough. I'm not sure if they stopped making this bag or what but I like it. Selling it on ebay now so I can have a bag for those extreme winter temperatures I anticipate. Wish me luck. I have read through several posts on here and can't for the life of me figure out how someone is cold in it at 40 degrees. I have slept under a tarp in -5 degrees and had a very minimal cold spot on my toes. If you are looking for a bag to be able to enjoy those cold camping trips this bag is for you. I went on a trip to Moab in March and it was definitely nowhere near freezing--maybe about 40 degrees at the coldest, and dry. And I woke up feeling pretty chilly in this bag, which is ridiculous given a 0 degree rating. I checked the label about 10 times to make sure that I wasn't hallucinating. My friend had a Sierra Designs 15 degree bag and was sweating! Hmmmm....be warned, it's not that warm. VERY OPTIMISTIC temperature rating! I've shivered at 40 degrees F, which is ridiculous. Nice and light but not adequate for winter snow! Be warned! The Kilo Plus 0 has been discontinued. The REI Kilo Plus 0 is not available from the stores we monitor. 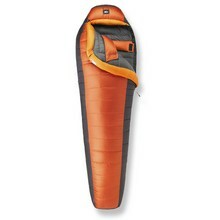 It was last seen September 3, 2008	at REI.